The Riverstone Line of Custom Made KNITTED Shade Clothes is designed to offer easy to use, shade producing cloth that is UV stable and will last for several years in ALL environments. THE KNITTED Shades are available in 3 of the most popular shade percents 30%, 50%, & 70%. All RSI KNITTED shades are Proudly Made in the USA. The RSI KNITTED shades are 20% thinner and lighter than a woven shade. RSI Knitted shades are more durable than woven shades although lighter due to the interlocking properties and design of the fibers. The threading will not move keeping the uniformity of the material, even when torn. Each shade cloth comes with brass grommets for securing the shade cloth. The grommets are placed approximately 2 feet apart around the perimeter of the each shade cloth. 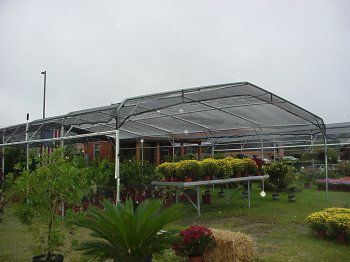 Helps to extend growing season and Protect assets from bird-related damage. The Riverstone Line of Custom Made White Tropical Weather Shade Clothes is designed to offer easy to use, shade producing cloth that is UV stable and will last for several years in the hottest environments. All Tropical Weather Shades protect at a 50% level. All our Knitted shade clothes are Proudly made from special mix of White Knitted polypropylene strands with Black Edging in the USA. Each shade cloth comes with brass grommets for securing the shade cloth. The grommets are placed approximately 2 feet apart around the perimeter of the each shade cloth. The Riverstone line of Shade cloths is designed to offer easy to use, shade producing cloth that is UV stable and will last for several years in the hottest environments. All our woven shade cloths are proudly made from black woven polypropylene strands in the USA. Each shade cloth comes with brass grommets for securing the shade cloth. The grommets are placed approximately 2 feet apart around the perimeter of the each shade cloth. The percentage listed above indicates the amount of shade that is being provided. This also reflects how tightly woven the shade cloths are. 10 Feet . X 8 Feet . Knitted Shade Clothes With Grommets-30 % Shade Protection The Riverstone Line of Custom Made KNITTED Shade Clothes is designed to offer easy to use, shade producing cloth that is UV stable and will last for several years in ALL environments. THE KNITTED Shades are available in 3 of the most popular shade percents 30%, 50%, & 70%. All RSI KNITTED shades are Proudly Made in the USA. The RSI KNITTED shades are 20% thinner and lighter than a woven shade. RSI Knitted shades are more durable than woven shades although lighter due to the interlocking properties and design of the fibers. The threading will not move keeping the uniformity of the material, even when torn. Each shade cloth comes with brass grommets for securing the shade cloth. The grommets are placed approximately 2 feet apart around the perimeter of the each shade cloth.